enjoy life in true Italian style. Come with me to discover my Italy and savor the flavor of “la bella vita”. This 7-day/6-night culinary tour in the Trentino region of Northern Italy includes trips to Dolomite mountaintops, dining in the finest regional restaurants, visits to top food and wine producers with tastings, guest chef cooking demonstrations, hands-on cooking classes with me and much more. Perfect for those who love nature, the great outdoors, food, wine, and cooking. 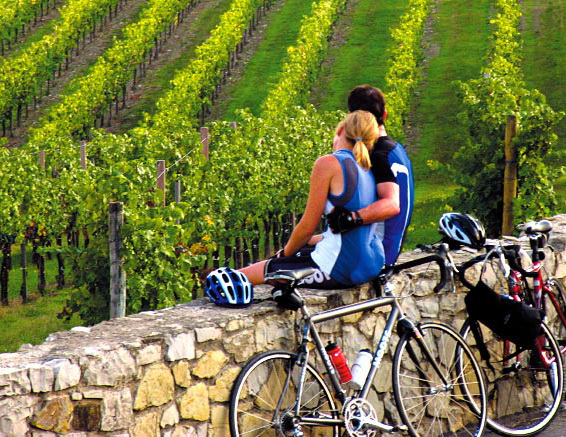 This 7-day/6-night sport/wine/food tour travels through the 4 most prestigious wine producing areas of Tuscany: Chianti, Montalcino, Scansano, and Bolgheri and is open to cyclists and their non-cyclist partners. Along the route we discover Tuscany’s iconic food, wine, history and culture that will give cyclists a well-deserved reward for their work with an exciting tandem itinerary of culinary and cultural activities along the biking route for non-cyclist participant. Perfect for active people who love cycling, wine, and Tuscany. This 7-day/6-night cooking-focused tour takes place in Chianti wine country—the heart of Tuscany—and includes four hands-on cooking classes and visits to local food/wine producers for a full immersion into true Tuscan cuisine. Perfect for those who love to cook and want to learn the secrets to preparing authentic Tuscan cuisine at home.